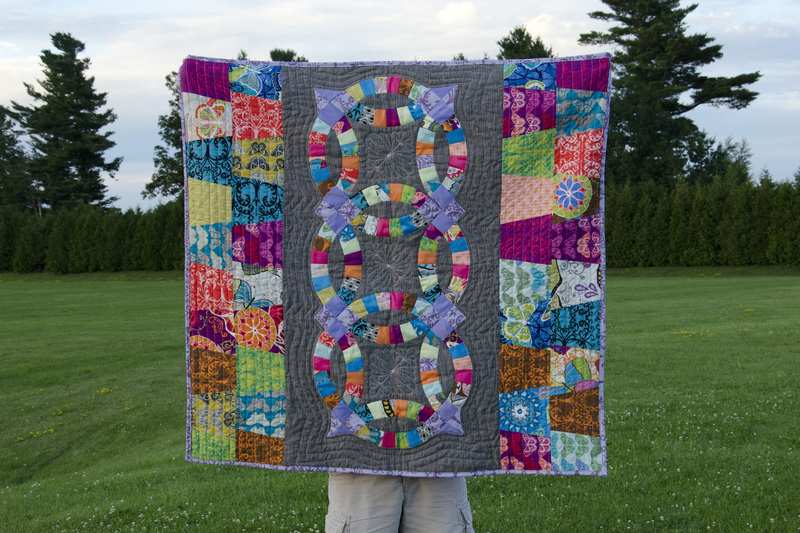 I started a double wedding ring quilt in the summer of 2012 as part of a local quilting group in Utica. At the time, I was still enamored with using all types of fabric for quilting, so I paired some Valorie Wells Cocoon with poly satin and a linen blend. After finishing three rings from a Double Wedding Ring pattern published by Free Spirit, I decided that was enough of that plan, and packed it all away. When I needed a baby quilt for another little girl this summer, I had the perfect excuse to pull it back out and cobble a new design together. “Jewelry Box”, Rachael Arnold, July 2016, 43”x41”. 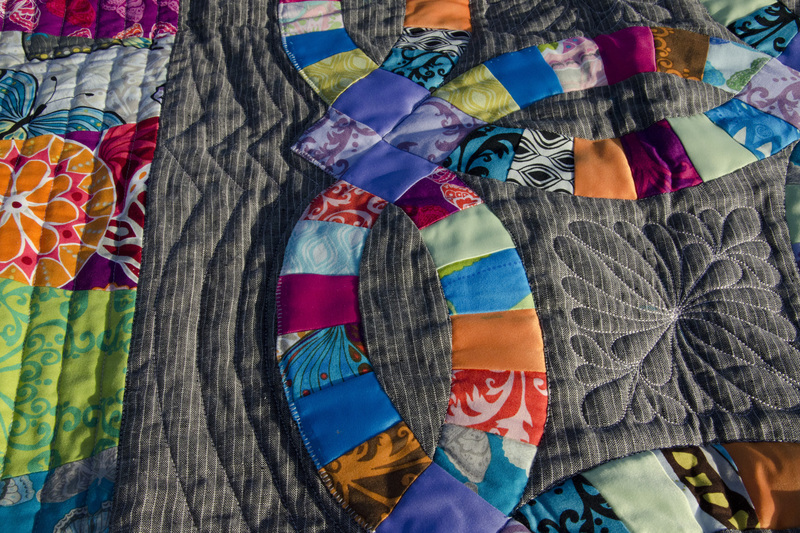 In addition to the three finished rings, the storage box contained a yard of a purple print, a yard of the butterflies print, two 6″ charm packs, a fair number of other charm squares cut into fourths, a quarter yard each of the five poly satins, and a ton of the linen blend. If I recall correctly, once I’d given up on doing an all-over double wedding ring quilt, I decided to do a somewhat complicated (and large) medallion quilt with the leftovers, but then put that off as well. This time around, I wanted something simple and baby-sized. Her sisters were recipients of the Impressions Baby Quilt (coincidentally started around the same time as this DWR) and Noble Blooms, both of which were around 40-45″ to a side, so that’s what I aimed for here as well. The length was easy—the rings were 40″ long—so I just had to worry about width. “Jewelry Box” (detail), Rachael Arnold, July 2016, 43”x41”. After thinking about it for a couple of days, I decided columns of charms on either side of the centered ring applique strip would work well to finish this off. To tie it in to the shapes in the rings, I sliced off the edges of the charms at an angle for a trapezoid shape, which still stacks well if you flip them around back and forth. I meant to have the strips on the edges be reversed (long edge of trapezoid to long edge), but pieced them incorrectly. I decided to leave them as is. I could have paid better attention to pattern placement within the strips as well, but in this case done is better than perfect. “Jewelry Box” (back), Rachael Arnold, July 2016, 43”x41”. It’s backed with a dimpled cuddle fabric—I wanted to be consistent with her sisters’ quilts rather than use the cotton yardage I had leftover. In between is Soft ‘n Crafty 80/20. The rings are a bit loftier because they’d already been quilted to a layer of batting back in 2012. Most of the quilting is straight line (and echoes of the rings). In the center of each ring, I used a machine embroidery quilting design for feathers. 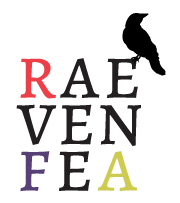 It looks okay on the front, but I’m a bit unhappy with the back of those sections due to the heaviness in the center. 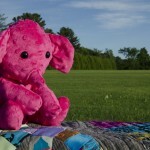 I considered much more intricate quilting, but didn’t want to squish the cuddle background too much. 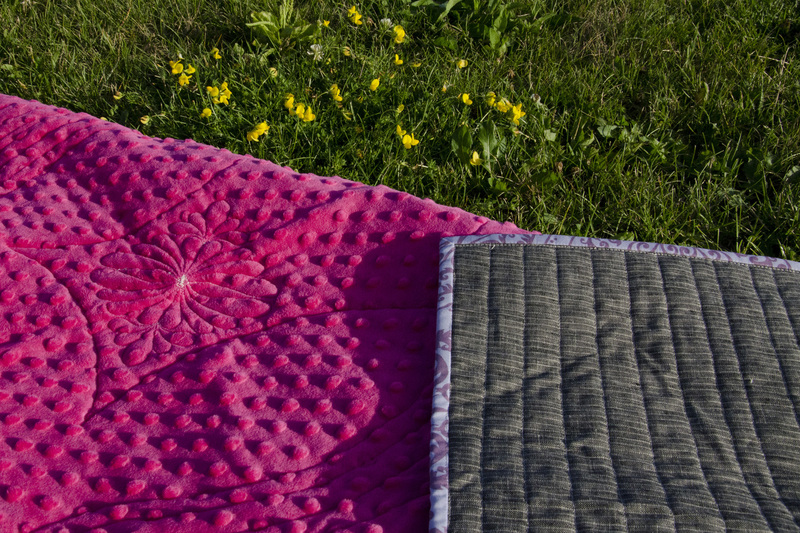 I used a pale pink Aurifil for all the quilting—it’s a nice contrast in the grey areas, and blends well into the colorful parts. (Also in the box of supplies—color matched rayon embroidery threads I’d intended to quilt with—those definitely wouldn’t have held up to use!) It’s machine bound in the purple yardage I had from the line. 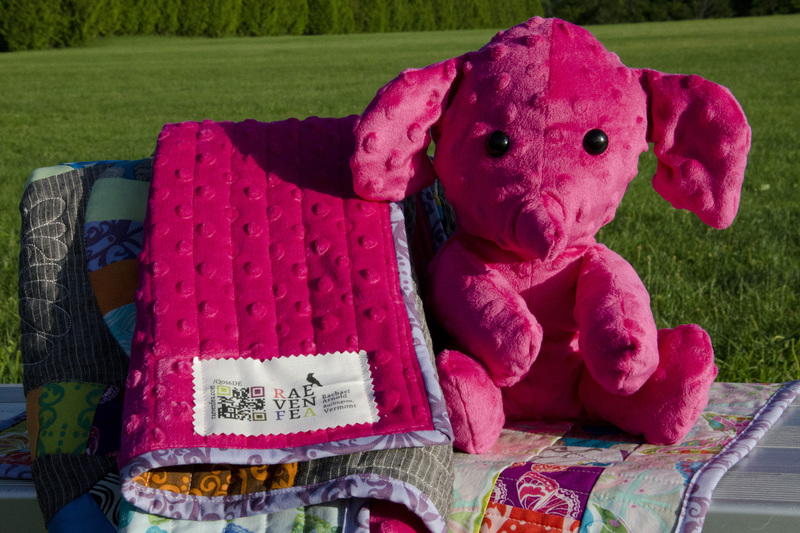 As I did for her sisters, I made a stuffed animal and doll quilt to go with the baby quilt. 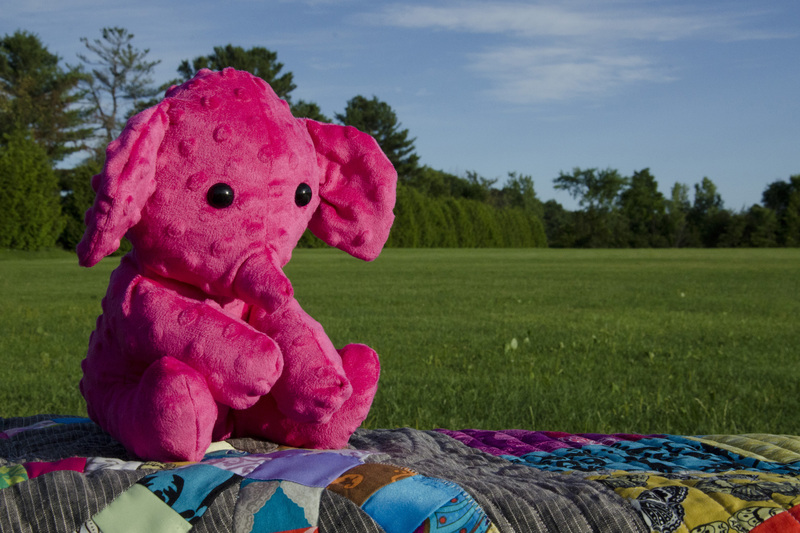 The stuffie is made from backing leftovers using my trusty copy of Simplicity 2613. 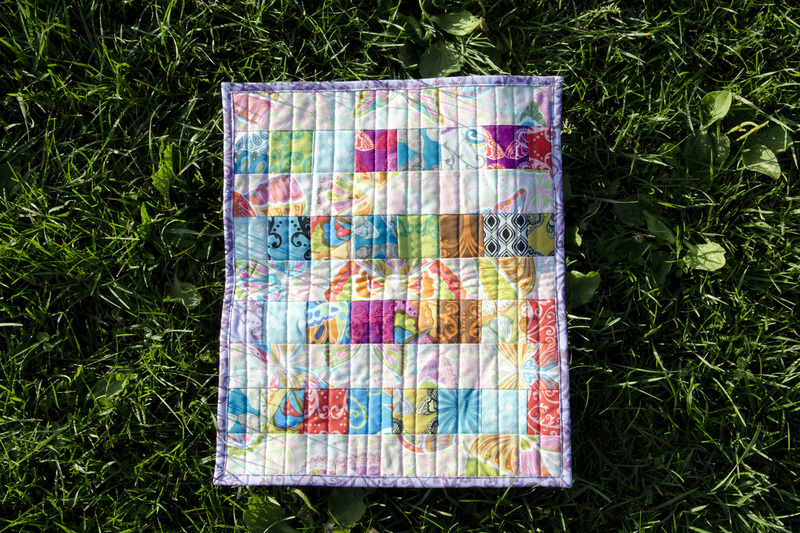 The 16″x18.5″ doll quilt used up the quartered charm square scraps (trimmed down to 2.5″ squares) and 2.5″ strips from the butterfly print. 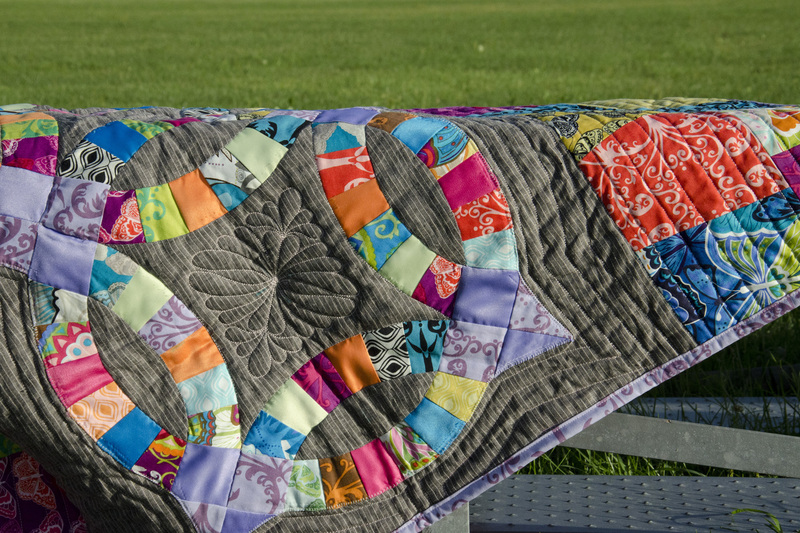 It’s backed with the pinstriped linen blend and bound with the same purple as the quilt. “Jewelry Box Doll Quilt”, Rachael Arnold, July 2016, 43”x41”. “Jewelry Box” (collection), Rachael Arnold, July 2016, 43”x41”.